In the early hours of Friday, 29th June 2007 a paramedic attending an incident at a central London nightclub reported a suspicious vehicle to the police. The police discovered that the car contained tins of fuel, gas canisters and a large quantity of nails together with a mobile phone based mechanism to detonate the contents. It soon turned out that this was not the only explosive device to have been positioned to cause carnage in London. Later the same day a second car bomb was discovered. It had been parked illegally only metres away from the first and towed to a nearby car pound. Workers who towed it reported the car smelled strongly of petrol, and became suspicious because of the reports that petrol was among the materials found in the first vehicle bomb. The second vehicle was found to contain the same bomb materials to those that had been found in the first vehicle. Just a day later, on the afternoon of Saturday 30th June 2007, there was a sudden shift of geographic focus. 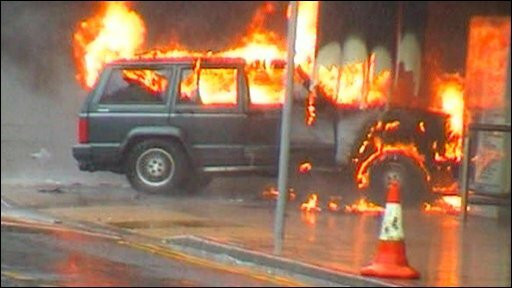 Glasgow, in Scotland, became the target when a Jeep Cherokee, loaded with gas cylinders, was crashed by two terrorists into the doors of the city’s main terminal. The attack was intended to be a suicide mission after the earlier attacks in London had failed. 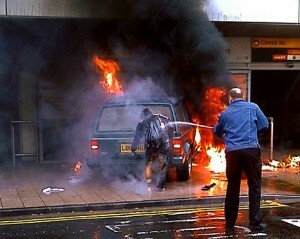 Holidaymakers fled in terror as the vehicle erupted in flames, setting part of the terminal building on fire. Two terrorists were arrested at the scene of the attack. One suffered severe burns and later died in hospital. These incidents came a few days ahead of the second anniversary of the 7th July 2005 London Suicide Attacks, when four terrorists killed 52 people on London’s transport system in the deadliest strike on London since World War II.